IdeaRoom is excited to introduce a Visual CPQ service specifically for carports — CarportView. With CarportView, your customers and sales team can visually configure buildings and receive instant price quote. Customers can design and save their carports any time of the day, wherever they are. Visual Confirmation Gives Buyers Confidence. When customers are able to see the final product, they are far more willing to finalize the sale. Customers are emailed a copy of their saved building image and pricing that they can use to sell to other stakeholders (e.g., a spouse). Deals are primed to close. Customers have explored their options, saved their buildings, and your sales team receives instant, detailed notice of deals ready to close. Many customers prefer online self-service to talking to a sales rep. CarportView is easy and fun to use. Automated pricing, building design logic and business logic ensures you get it right. You select from our extensive library of features and finishes to make available to your customers in your configurator. Design logic ensures accurate configurations. Your company’s CarportView page will be customized with your logo and color scheme. CarportView is hosted by IdeaRoom, so you don’t have to handle any technical set-up or maintenance. An intuitive menu guides your customers through the shed designing process. Captivating visual renderings of your shed updates instantly as your customers’ make their selections. 3D shed image can be rotated, allowing your customers freedom to explore their shed design. Customers’ price estimates are updated instantly as they design. When their design is final, customers’ save their designs and get a copy of the design and estimate in their email. Your current pricing is programmed into CarportView. Customers enter their contact information when saving their building, capturing highly qualified leads. CarportView captures valuable business analytics such as most commonly selected features. Your sales team receives an automated email with customer information, all the building details, and a price estimate once your customers save their designs. Automated sales tool allows 95% of the sale to happen unassisted by your sales team. 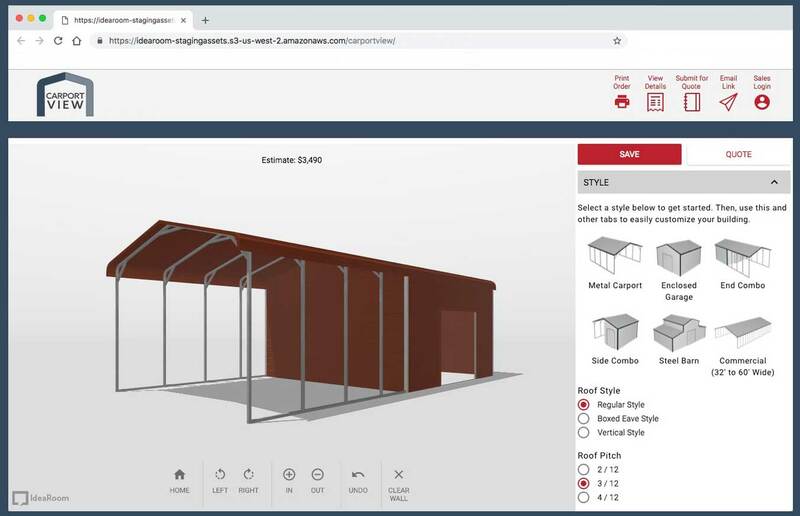 CarportView can be used interactively by a sales representative to better collaborate with customers on their custom design. Our compensation is based on your business size and grows with your revenue. Obviously this gives us a huge incentive to help you grow your sales and delight your customers—just as you want. Set-up fee covers selecting available options, customizing CarportView page with your logo and colors, configuring your design logic, setting up lead generation workflow. Subscription fees vary based on business size and cover ongoing hosting services and included updates such as pricing updates. Contact us for a specific quote.